Williard Saunders, admissions director for Monarch Academy, gathers with student, teachers, and parents in front of Baltimore City Public School headquarters on North Avenue. Last week the Baltimore City School Board voted to revoke the charter of Banneker Blake Academy and close the school in June 2019. The board is to vote in January on closing five more schools—two traditional and three charters. 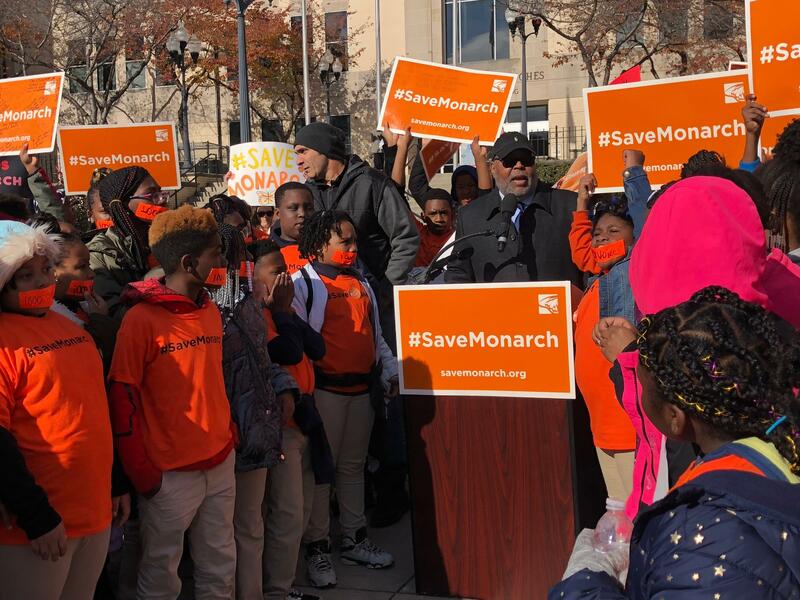 About 100 students from Monarch Academy in northeast Baltimore, one of the schools on the board’s hit list, marched up the steps of City School Headquarters on North Avenue last week. “Monarch teaches us to be kind, be safe, and be productive,” says seventh grader Kamilah Chase. Kamilah and her friends worry about where they will go if the school board decides to close their school. Williard Saunders, admissions director for the school, is trying to prevent that from happening. “And you see these children right down and they say, I am a voice. I am more than a score. I am more than a number,” says Saunders. The main critique the school board provided in a report completed by school officials for Monarch’s closure was low standardized test scores. “As we know the PARCC scores are not a good measuring of students’ success,” says Saunders. “There is not a question with the quality or the rigor of the PARCC tests,” says Alison Perkins-Cohen, chief of staff to School CEO Sonja Santelises. She says PARCC test or the Partnership for Assessment of Readiness for College and Careers standardized test, is still used widely in Maryland other states to measure students’ academic success. Monarch Academy, along with Martin Luther King Jr Elementary/Middle, Gilmor Elementary, Northwood Appold Community Academy, and Roots and Branches School/Harriet Tubman Building are in the board’s sites, mostly because of lack of services to special needs students. Nikia Nicholson, Monarch’s chief academic officer, says the school has complied with all special needs standards and that the school board is isn’t providing sufficient evidence for these statements. But Perkins-Cohen says like the other schools on the chopping block, Monarch is lacking in services provided to special needs students. City schools reviews three areas in assessing whether or not a school remains open. “Academic performance, it has to do with delivery of services to special education students, it’s had to do with management or mismanagement issues,” says Perkins-Cohen. Perkins-Cohen says the city school system does not take the decision to close schools lightly. They try to help parents and student find other schools that meet their needs and preferences. Baltimore City Schools’ board of commissioners voted seven to zero at Tuesday night’s meeting in favor of closing Banneker Blake Academy in north Baltimore. WYPR’s Dominique Maria Bonessi was at the meeting and spoke to Morning Edition Host Nathan Sterner about the board's decision.